Coaching... Coach Bertucci has provided a great deal of structure and a great team environment, his decision to bring on Kyle Cocozza as an assistant has been extremely positive. Kyle brings a great presence to the team both with his love of the sport and his willingness to get out on the Mat. You can tell he has already made a positive impact on the boys! The Varsity Team.... 106 lbs. 8th grader Mike Stanley has a bright future with this team.. His approach to this season has been perfect. He knows the more Mat time the better! 113 lbs Kyle White, Freshman, a 2nd year wrestler who works hard and has a positive attitude! He has already pulled out a couple big wins and also has a bright future..keep working hard! 120 lbs, Sophomore and 2nd year wrestler, John Goode.. This kid is full of heart and as strong as they come.. only his 2nd year wrestling and already putting together a great resume.. 3rd at Div 1 South sectionals last year at 106 lbs, has pulled off some great wins so far this year.. Placing at states this year is a very realistic goal for this up and coming wrestler! 126 lbs Junior, Casey Connor, The sky is the limit for this talented wrestler he was unbeaten up until the Marshfield Tournament and hit a little speed bump, although he still managed to pull of an impressive 5th place at this highly competitive tournament, Casey placed 3rd at 113 lbs Div 1 south sectionals last year and looks to improve on that and place at the State Tournament this year! 132 lbs has been in flux this year with some 1st year wrestlers taking some Mat time as well as Connor and Goode wrestling up when needed.. More consistency and stability will be needed here..perhaps time for someone to step up? 138 lbs, Freshman, Vinny Ciliberto has had a great start, Vinny is a product of our once existing youth program and he continues to impress the coaches with his strength and his constant improvement. 145 lbs, Sophomore Ben Potts, has had an up and down beginning, battling some old and new injuries but always a fighter he pulled off a big win for the Team at Bristol Aggie and he is getting as much Mat time as possible to get better! 152 lbs. Co-Captain, Senior Charlie McWilliams is flat out impressive! after missing his whole Junior year on the mats he picked up this year right where he left off as a Sophomore, His quiet, lead by example attitude and his strength and technique will take him far into States this year. His 2nd place finish at Marshfield is a huge statement! 160 lbs, Junior Liam Shields, another fighter! this 2nd year wrestler is very close to turning the corner.. his hard work and huge heart are paying off and he will continue to get better every week.. Liam had an impressive win at the Marshfield Tournament and he has been a bright spot on this team since day 1! 170 lbs has also been a back and forth weight class for the Red Raiders.. Injuries have put this weight class on hold for now, hopefully we will get to see Junior, Sean Ford return to the Mat to shore up some wins! 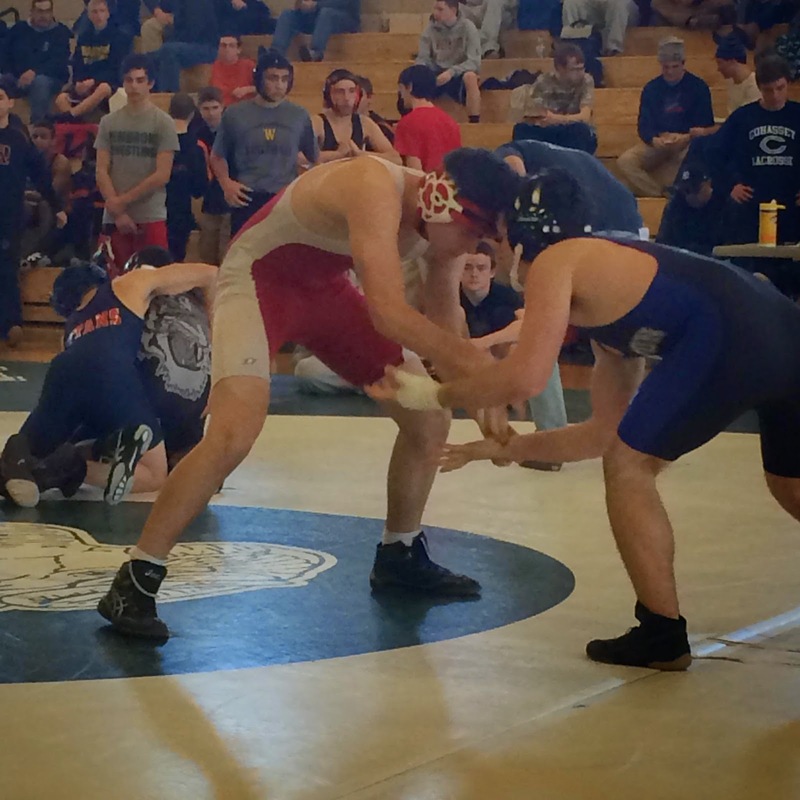 182 lbs, Sophomore, Alex Lopes, the Team was fortunate that Alex transferred into Barnstable from Western Mass with a good deal of wrestling experience. His addition to the team has been well received and he has filled a weight class that would have otherwise been forfeited or filled by a first year wrestler. He pulled of a couple big wins at Bristol Aggie including a pin.. Alex has good skills on the Mat and looks to keep improving.. 195 lbs. Junior, Mike Bertucci has also impressed his team and coaches so far.. His early success wrestling up at 195 pounds has been a huge lift to the team! 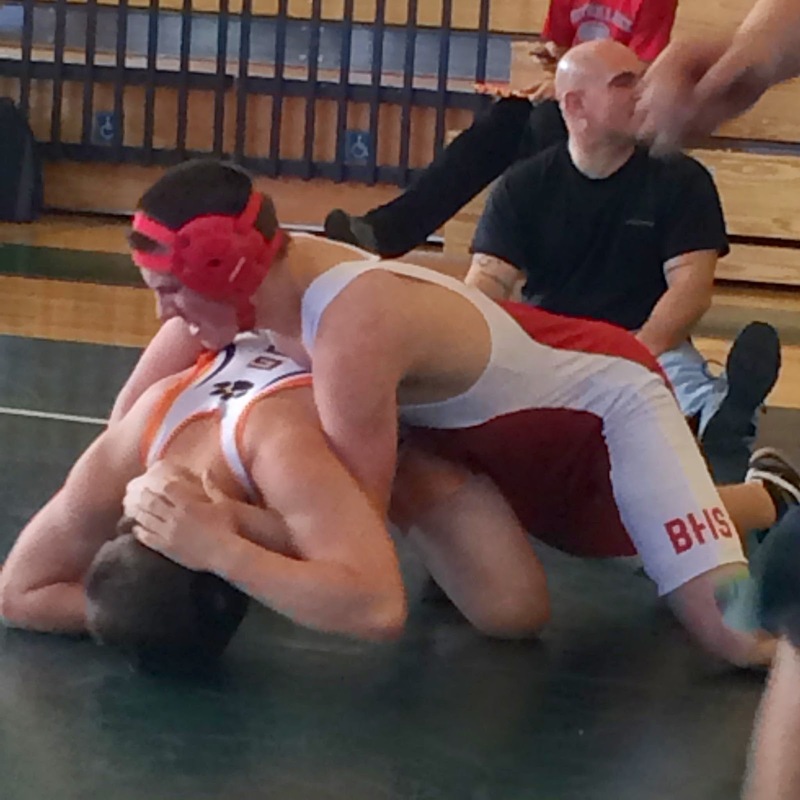 Mike had an impressive run at the Brockton Quad Meet, going 3-0 with 3 pins! 220 lbs. Co- Captain, Senior, Donny Mach, has hit his stride.. His huge improvement is hard to miss! He has stepped up his game this season both as a dominant wrestler and a great vocal team leader! Donny placed 3rd at the 2 day Marshfield Tournament, and looked strong and impressive both days! Heavyweight, Co-Captain, Senior, Owen Murray. Is a Beast!.. This wrestler does things during matches that coaches and fans can't believe, but just as impressive, is his work ethic during practice. always going the extra mile and pushing himself to be a Champion, he makes all of his teammates better! Undefeated so far this year, Owen is well on his way to a New England Championship! These boys are the future of our wrestling program .. Great Job getting Mat time and improving! 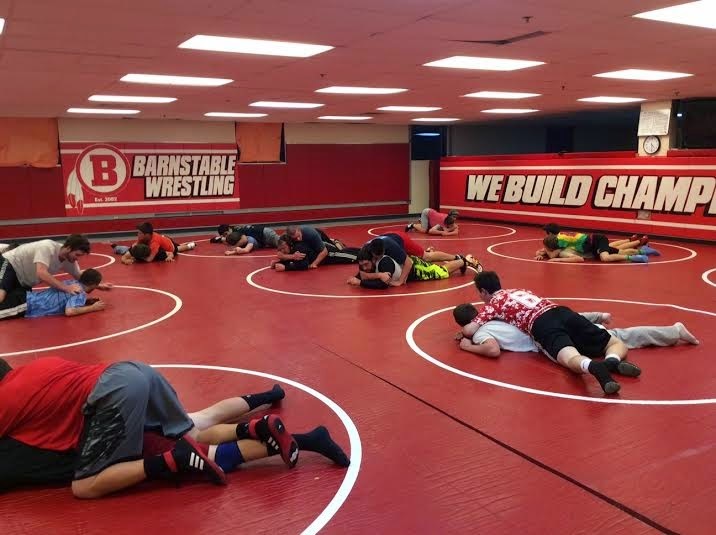 Barnstable Travels to Brockton on Saturday 12/20/14 for a Quad meet against Brockton, Braintree and Saugus..
Make a note that the team will practice and compete during the holiday break..
Good Luck To All Wrestlers This Week! After a great start to the season, the Red Raiders are back on the Mats and getting ready for a busy week. BHS will travel to Nauset on Wednesday, 12/17 for a group practice/scrimmage. Coach Bertucci was able to secure bus transportation, so parent car pooling is not needed! The Bus will leave BHS at 2:15 and will return around 6:30... Uniforms are optional..
Barnstable beats Wakefield 39- 36 in the final to take 1st place! Barnstable is 3-1 so far and in the finals. Going for first place against Wakefield. Let's go Barnstable! The Team has been working very hard, and the season will start off this Saturday 12/13 as the Red Raiders travel to Bristol Aggie for an 8 team tournament..
Coach's Bertucci and Cocozza have the boys working hard and setting the tone for a successful season. Wednesday, December 10th is weight certification day, the Dr. will be at practice to certify all wrestlers for their weight class.. This is Mandatory..if you don't get certified you can't wrestle.. Don't miss practice!